In 1989 I was the No2 ABA ranked Heavyweight of Great Britain. My passion was boxing and after several more years in the ring I decided that rather than fighting myself, I wanted to start training people instead. A couple of professional qualifications later and I was the man in charge-i.e. solely responsible- for the boxer in the ring. Why did you move away from boxing? I was very successful as a trainer, but suddenly realised that instead of being responsible for one life, my passion and commitment meant that I could actually have an effect on many more lives, so I started looking for new challenges. How right I was. 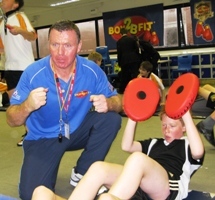 To date through SKIP2BFIT, I have directly impacted on the lives of over 500,000 young people. How did you come up with the idea of SKIP2BFIT? My path has been an interesting one. After I gave up training full time, I moved into the construction industry. A couple of years on I was managing a team of people.I was good at motivating people even then! I started realising that I needed to link this passion for people and fitness more constructively and initially worked within personal training, which helped me to motivate secondary school pupils through a structured exercise programme. My real eureka moment came when I discovered a PE cupboard full of dusty, disused skipping ropes. I realised that these basic old-fashioned cotton models needed to be updated in order to appeal to the modern child - used to instant feed-back and immediate results. 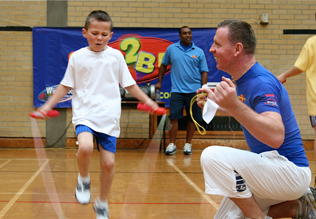 I decided there and then to create a new generation of skipping ropes for a new generation of children. And the idea for the logo? That came to me in the bath. I was lying in the bath trying to think of names for the new skipping programme that was new and refreshing. I was listening to the normal conversations in the house. My wife was shouting up the stairs to my daughter to stop texting on her phone. I realised texting was the young person's way to communicate with a language of their own. I translated this and SKIP2BFIT was born. It must be pretty hard work – what keeps you going? I am passionate about SKIP2BFIT because it gives people the confidence to be the best they can. 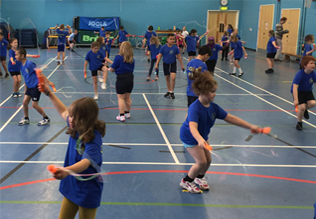 Working with schools over the years the Skip2Bfit programme has further developed to what it is today. I passionately believe that the 2 minute Skip2Bfit fitness challenge is something that can help impact on today's obesity crisis. People need to be made aware that they are responsible for their own health and handing out leaflets is not the answer. 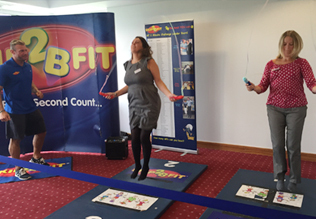 The 2 minute Skip2Bfit challenge gives everybody the opportunity to challenge themselves and set themselves a target to improve and now with the Skip2Bfit App all you need is a Skip2Bfit rope.